Sunny days sound like oh so pleasant weather but they just don’t jive with birding in the tropics. Walk out there beneath the blazing sun and it feels like the non-stop beat of a laser-mallet right on top of the head. This is why we wear hats, especially the wide-brimmed ones, and we wear them with pride. This is also why we don’t expect to see many birds on a sunny day in Costa Rica. They don’t need to warm up the feathers because it’s always warm! The cloud forest birdies in particular seem to be very loyal with their sunny day boycott. Go birding in middle elevation forest in Costa Rica (or anywhere in the neotropics) and you will appreciate (and curse) the ability of those birds to hide in plain sight. 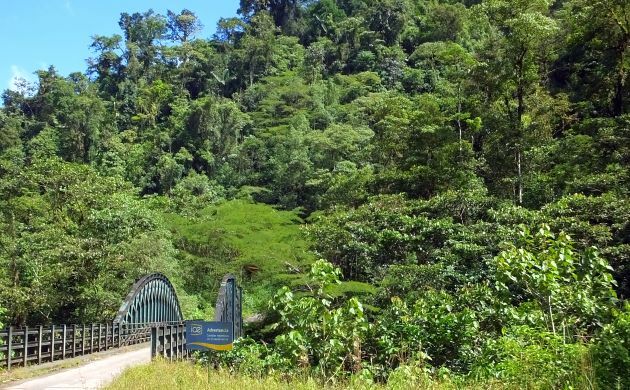 As one might imagine, this post talks about the things you might see on a sunny day of birding in Costa Rica, especially at one of the most classic middle elevation sites in the country. 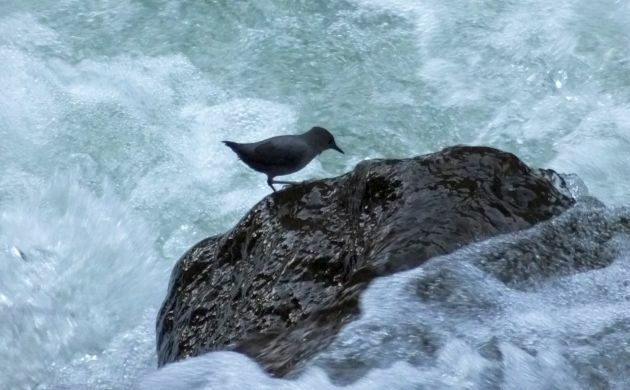 It wasn’t quite so sunny at six in the morning so birds were still active, including American Dipper at the La Paz waterfall. Our next stop was a quick one at the Cafe Colibri in Cinchona. It was a coffee stop so we didn’t stay for birds but couldn’t help looking at Violet Sabrewing and Green Thorntail. This is not a Violet Sabrewing, nor is it a wasp in flight. Then it was off to the forested canyon known as Virgen del Socorro. 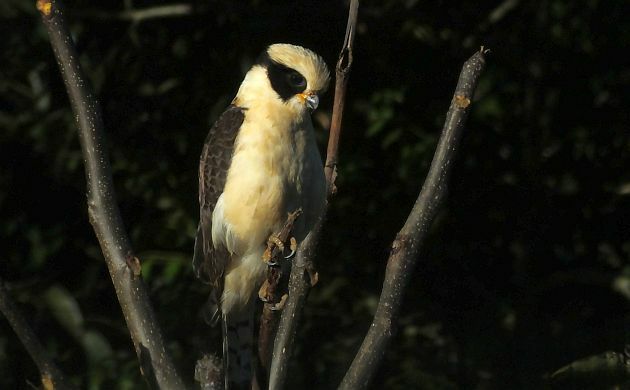 We saw this Laughing Falcon on the side of the road. The sun was warming things up but not to the point of chasing the birds away. 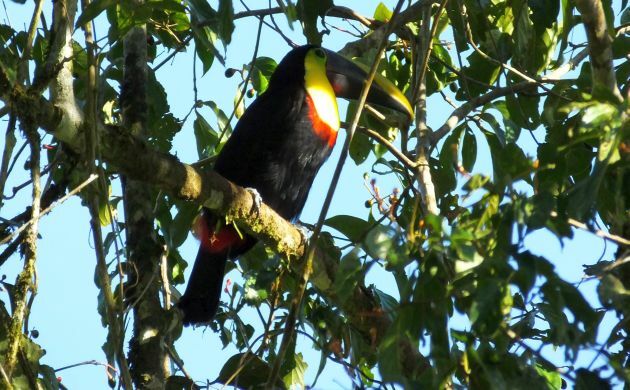 At a fruiting tree, we enjoyed close looks at Emerald Toucanet and Black-mandibled Toucan. In being a Lauraceous species, it was also the perfect tree for a cotinga but despite waiting and carefully watching, nothing else appeared. I can’t help but wonder what visited that important food source later on. Black-mandibled Toucan used to be Chestnut-mandibled Toucan. Just down the road, we saw Collared Trogon and a few more birds. 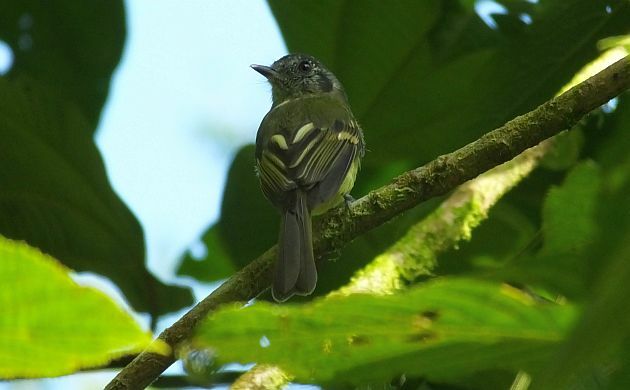 A close Slaty-capped Flycatcher was nice! However, after the Slaty-capped Flycatcher, the sun rose just high enough to shut the forest birds down. Although that pretty much cut out hopes for a mixed flock, at least it was a boon for raptors. As the usual BVs and TVs took to the sky, we picked out a distant Barred Hawk, had great looks at a White Hawk, and had a few Broad-winged Hawks. 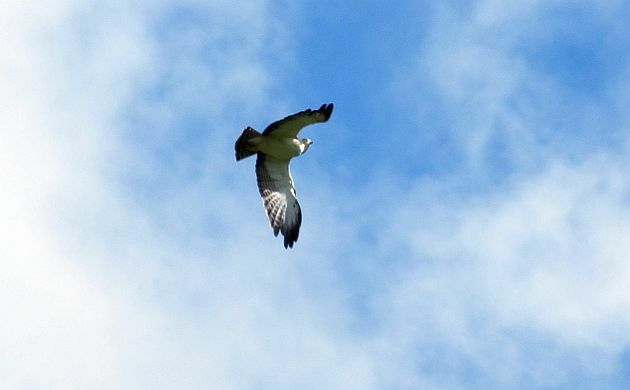 We also had the requisite Short-tailed Hawk– one of the more commonly seen raptors in Costa Rica. It was also a nice place to eat lunch! By two p.m., the clouds took over and birds started singing and coming back into play. Although I don’t have pictures of them, we had Black and yellow, Speckled, Emerald, and Hepatic Tanagers along with Tawny-capped Euphonia, White-ruffed Manakin, and other expected species. 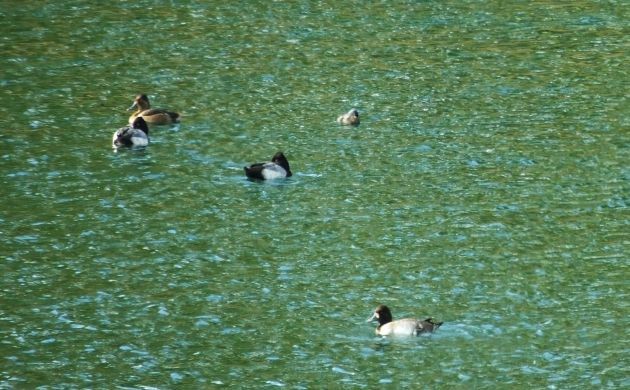 Lesser Scaup and a Ring-necked Duck were kind of unexpected at a small reservoir. 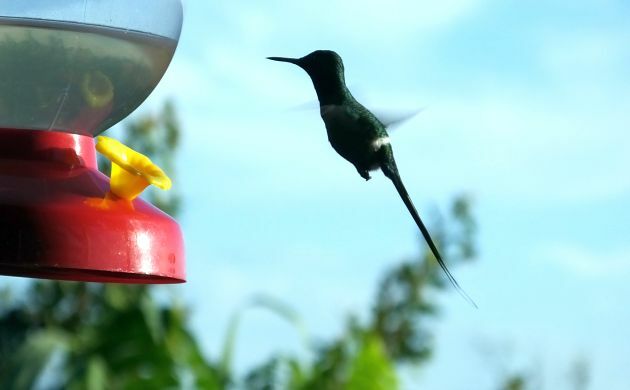 After that, we pretty much headed back to the Cafe Colibri (“Hummingbird Cafe”) to tally up the bird list. 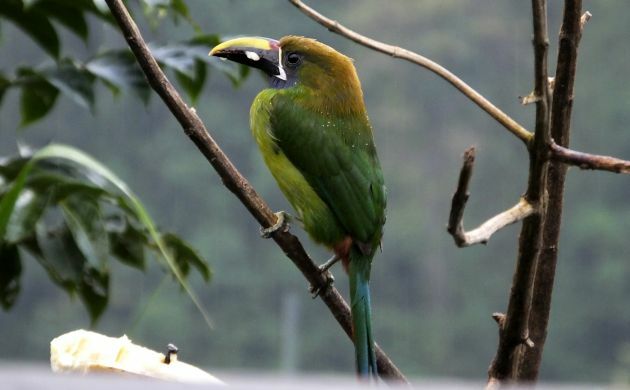 We also enjoyed more sightings of super close Emerald Toucanets. Despite the anti-bird activity sunny weather, I was surprised to see that we still saw 90 species and heard 18 more! I guess there’s always a lot to see in Costa Rica, even on a sunny day.